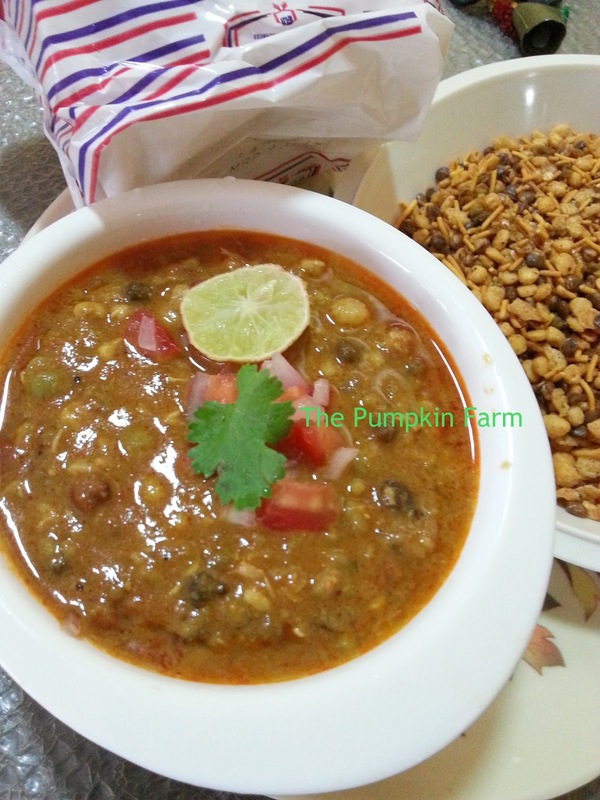 Usal is a curry made with lentils and coconut based gravy. At my home, we do not mix lentils often and usually have each kind of lentil cooked differently in terms of the quantity of ingredients. For e.g. the moth or whole green grams would be cooked with on only fresh coconut while the black peas, green dal will be cooked with more of dried coconut. Also a few ingredients like black pepper and others vary for different types. However, this week I had a pack of mixed sprouts which is usually eaten by DH for breakfast. But since it was sitting in fridge for couple of days, I planned to make a quick fix usal for us. 4) In a pressure cooker, add some oil. 6) Add the sprouts and all dry masalas and stir well. 7) Add about 2.5 cups of water and stir again. 8) Cover the pressure cooker and let it till full pressure (or 3-4 whistles). Wat a protein packed curry, would love to have simply with a bowl of rice and few papads..
Gravy looks too good and like the lentil and coconut combination. Have heard of Usal from my Maharashtrian friend...this one looks so tempting and comforting. Nice nutritious curry !! Goes well with rotis !! a very different curry!! new to me and very nicely done! Healthy & nutritious usal.. Looks perfect and comforting.